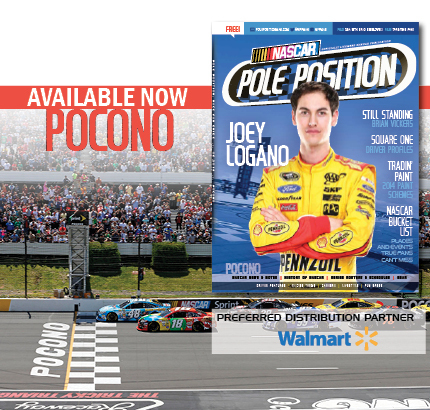 NASCAR Pole Position Pocono edition is now available. Please head to Walmart, or other area retailers that offer free magazines, to pick up your free copy. You can find a list of preferred retailers distributing NASCAR Pole Position here. Magazines were shipped to area Walmarts that feature Tire & Lube Express departments. Be sure to tell them NASCAR Pole Position sent you! And remember the magazine is free for all race fans! If you are not in the race market, you can get a subscription to NASCAR Pole Position here right now. WANT A FREE WEEKLY NASCAR MAGAZINE? ROAR! is a digitally-delivered, weekly magazine that reviews the week that was, and provides fans with a preview of the upcoming weekend. ROAR! is available for FREE for your desktop or laptop computer, your iPad, iPhone, Android device (via Google Play) and even your Kindle Fire. It’s free … so what do you have to lose? For desktop/laptop access: a simple signup at www.getroar.com (we only require your email address). You will receive an email every Wednesday with a link to the latest issue. For mobile phone and tablet users: search ROAR Race Preview in your respective app store. Next Article » Read the Latest Issue for Free on your Tablet or Computer. It's Free!